Discover the historic city of Laramie when you stay at this charming 2-bedroom + loft, 2.5-bathroom vacation rental condo! 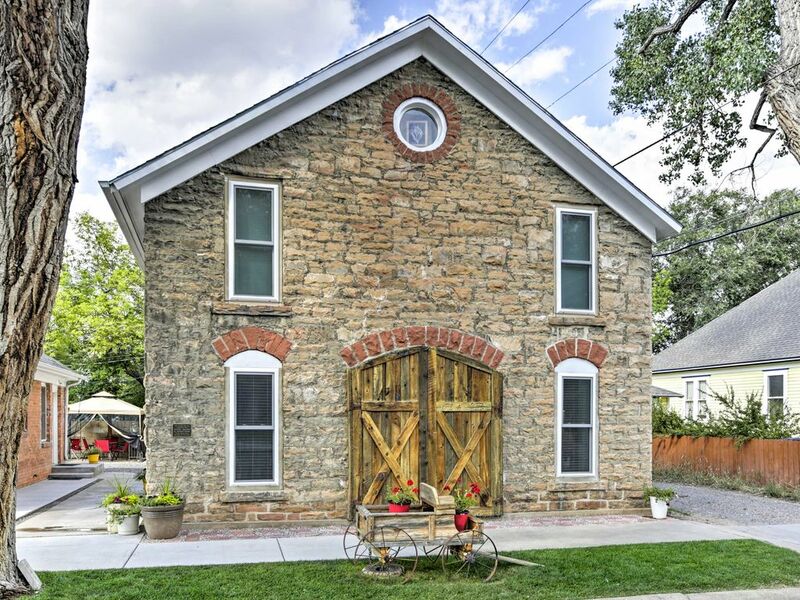 Originally built as a stone stable in 1883, this unique getaway was fully renovated in 2017 and provides several modern conveniences, like free WiFi and central A/C, while still maintaining its old-world charm. Whether you're visiting downtown just 3 blocks away or exploring the many outdoor activities nearby, you'll enjoy an amazing escape at your new home-away-from-home! Upon arriving at this Wyoming retreat, you'll instantly fall in love with the exterior, designed with beautiful stone walls and a rustic decorative wooden barn-like door. Step around to the West side to enter and find the inviting living room complete with a plush sofa, comfortable armchair and flat-screen Smart TV. Opening seamlessly to the living area, the dining room and eat-in kitchen make it easy to entertain guests while cooking! Effortlessly whip up your favorite dishes before settling down for a quality meal at the dining table. On warm evenings, utilize the gazebo and gas grill out back to enjoy a cookout in the open air! If you want to get off the property, simply stroll across the street to check out the Laramie Plains Museum and remarkable Ivinson Mansion. For a tranquil night's sleep, take solace in one of 2 bedrooms or head upstairs to the private third-story loft. The condo offers an assortment of comfortable bed sizes including king, queen, full, and twin beds. Just 3 blocks west is downtown Laramie, offering a mecca of local shops, delicious restaurants and historic sites! From the city, you can also visit the Laramie Historic Railroad Depot that houses a small museum, art exhibits and various community functions. A quick 3-block walk east will take you to the University of Wyoming campus, where you can watch a football game, gaze at stars in the planetarium or access the University of Wyoming Geological Museum! Also near the home is LaBonte Park, offering a family-friendly community garden with a skate park, soccer fields and playground. For a day trip, take a quick 30-minute drive to Medicine Bow National Forest to hike the scenic trails, fish along the rivers and look out to breathtaking vistas on the Snowy Range Scenic Byway. In the wintertime, head to the Snowy Range Ski Area to shred some fresh power on your skis, snowboard or snowmobile! - Amenities include a fully equipped kitchen, 2 flat-screen Smart TVs, free WiFi, central heating and air conditioning, linens, towels, a patio, gazebo (only available in May-September), gas grill (gas provided-only available in May-September), designated parking, and much more! - Amazing Laramie location - Across the street from the Laramie Plains Museum and minutes from downtown, the University of Wyoming and several outdoor activities! Owners were accommodating and ready to help with any issues. We were in town for a swim meet during a snowstorm and had awhile before our check-in with no place to go. I called and asked about possibly getting in a little early. Even though they were at the airport they were still willing to take our call and help us out. The condo is very well outfitted with everything you could need. Although the pictures and description are good I think it would be very difficult to do this place justice with either. Our stay here was great. This was a perfect quite location that was much better than any hotel we could have found. The space and how it was utilized was incredible. I would have liked the architect and contractors for my own house. We will definitely be trying to stay here again if we have a reason to be in Laramie overnight. This is our 2nd stay at the loft. We are completely satisfied with all aspects - from booking to the comfortable condo and well stocked kitchen to an easy checkout. Joyce does a wonderful job maintaining a clean and inviting place for us to stay while in Laradise. We will be back! Simply Amazing. Our Best HomeAway Yet. My wife and I have stayed in a lot of places for our adventures and this place takes the cake. Super clean, super neat and tidy and well-laid out. It has everything. I could not be more impressed. To top it off, both condos have a private parking spot behind the building so you don' t have to leave your vehicle on the street. Great condo with everything you will need. The condo is very clean and the neighborhood is quiet. I recommend you book this place. We stayed here for Thanksgiving Break visiting our daughter, who attends University of Wyoming. The property was quiet, modern and clean. The kitchen was well equipped for us to cook. We would highly recommend this property.